Food from the royal kitchens of Limdi and Bhopal had now been crossed off the list. Although the little bit of experience we had with the food from the two princely states could never justify the vastness of the cuisine, it was at least a start. The next in the ‘Royal Cuisine Trail’ was from the kitchens of Bhainsrorgarh Fort. The Bhainsrorgarh Fort is a beautiful heritage property which has now been converted into a hotel. The nearly 250+ years old fort at point of time was impenetrable. Situated on a cliff it is surrounded by the Chambal river on side and Bamani on the other. To justify the food we had the night from Rajpootana Kitchen, I have to first tell of my first encounter with Kunwar Hemendra Singh. His passion for food, cooking and knowledge of ingredients is can’t be explained in mere words. When we first met, he had made us a Hari Mirch ka Maas and Jungli Aloo in a commercial kitchen which was literally one of the best dishes I’ve had in awhile. Yet he’s his own critic and lamented the change in taste that he could have got with with his own set of tools and at his kitchen. That’s when I knew that the food was going to be worth every bite. As Kunwar Ajay Raj Singh of Begu would later tell me that Hemendra Singh did head out early morning to get the right cut of meat from the butcher for each of his dishes. Starting off the dinner was with the Bakre Ki Champ and Macchi ke Sule. The Bakre ki Champ were mutton ribs which had been roasted magnificently with spices. In the afternoon I did sneak a chance to get into the kitchen while Kunwarani Vrinda Kumari Singh was marinating the fish and all I did notice is the simplicity. Other than the basic spices, there was no extra dose of masala and the fish was the centerpiece. These were then smoke-roasted to give us the delicate melt-in-the-mouth sooleys. Now it was time to indulge in true Rajasthani-style food. There were a couple of dishes that I’ve tried before and some hereto unknown. The Safed Maas Hari Mirch was exquisite along the with the Jungli Chicken. If we take a look at Indian culinary history on a simpler note, then you either had a red (Laal) or a white (Safed) gravy to each of your dishes. The Laal Maas as a dish is a very colloquial term that went to named as a dish. The Safed Maas in turn had a light tanginess from the curd with the spice coming from the fresh green chilis. You’d be amazed to know how 3 ingredients can make a wonderful dish and that was the Jungli Chicken. Just meat, red chilis and ghee is all that goes into making a Jungli Chicken and yet it’s the precision at which to cook it makes the difference. This was simple authentic Indian cooking at it’s best. The Siri Paya makes use of both the trotters and head of mutton to get the juices out with all of the spices with a slow cooking. The result was a magnificent gravy which I thoroughly enjoyed. The vegetarian dishes that night featured traditional Rajasthani dishes like the Bharwa Bhindi, Sangri ki Sabzi, Gatte ki Sabzi and Papad ki Sabzi. The Makki ka Soyta was another superb dish where the mutton was cooked with corn kernels. I liked the fact that there was Bafla to go along with the gravies. The Bafla are balls of dough which have been baked with a shine on top coming from clarified butter. These can be crushed to help soak in any of the gravies much like what a bread would usually do. The desserts from the kitchens of Bhainsrorgarh that night was the Makki ki Kan and Panna Halwa. The Panna Halwa a dessert made with Hara Channa (Green Lentils) had me excited, a dish you’d seldom come across most menus across the country. 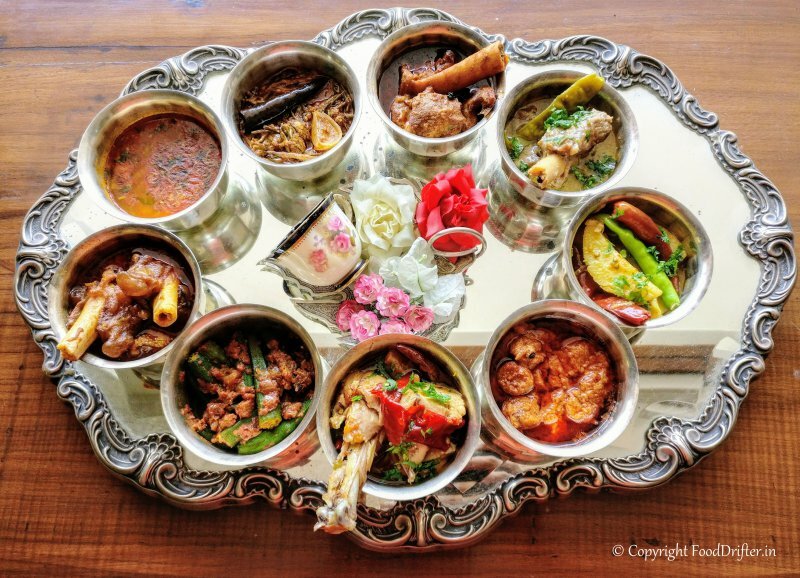 It was a wonderful meal curated by Rajpootana Kitchen from the erstwhile princely state of Bhainsrorgarh. Each of the meals we’ve had till are soaked in history, with each dish having a story to tell. With the next post we travel to the kingdom of Dhar.